The weather has been fluctuating this week; several days brought us temperatures in the upper 50’s reaching 62 one day, while the remaining days were much cooler. And there is snow looming tonight with the big question being how much. I’m rooting for not much. Francisco de Zurbarán of the Biblical patriarch Jacob and his twelve sons. The paintings are based on “The Blessings of Jacob,” the prophetic poem from Chapter 49 of Genesis. The series of paintings is first recorded in England in the 1720s, when it was purchased at auction by a Jewish merchant, James Mendez. In 1756, all but one of the paintings passed into the hands of Bishop Richard Trevor of Auckland Castle, County Durham, an advocate for the rights of Jews in England. The paintings have remained in Auckland Castle ever since, traveling to the United States for the first time on the occasion of this exhibition. The portrait of Benjamin, which was the only one that Trevor wasn’t able to acquire, has been lent by Grimsthorpe Castle in Lincolnshire. It has been reunited with the other paintings for the first time since their creation. These are links to all 13 paintings. Benjamin – In the notes for the painting it says that the image of the wolf came from an engraving by Jacques de Gheyn II who also depicted Jacob and his sons. A link to that image is below. Zurbaran was influenced by de Gheyn’s series of engravings and I’ll link to those images. Gad – Zurbaran based this image on the biblical interpretation of Gad and his tribe as adept in battle rather than an existing image. Naphtali - For Naphtali’s pose, costume, and attribute, Zurbarán turned directly to the figure of Christ in Albrecht Dürer’s Christ Appearing to Mary Magdalene from his Small Passion series of woodcuts. The Durer engraving is below. Joseph - Details of his costume are taken from Jacques de Gheyn II’s series. Zebulun – Zurbarán borrowed aspects of the composition including the facial type, anchor, and viewpoint, again, from Jacques de Gheyn II. Judah - Jacques de Gheyn II’s print of Judah, which includes a lion, scepter, and crown also informs Zurbarán’s imagery. Dan - The pose and gesture of Dan are lifted almost directly from a figure in Jonadab Counseling Amnon, a print by Philips Galle after Maarten van Heemskerck. Issachar - The donkey appears as an awkwardly cropped head cutting in on the left side of the canvas, a detail taken from Jacques de Gheyn II’s print. Reuben - The primary visual source for Reuben has been identified as the standing figure of Pontius Pilate dressed in a turban and robe from Albrecht Dürer’s woodcut The Flagellation from the Small Passion series, a source perhaps for the column as well. Levi - Levi is shown in fanciful garb derived from a Mesopotamian figure in Philips Galle’s print The Story of Shadrach, Meshach and Abednego, after Maarten van Heemskerck. Simeon - Simeon strikes a pose that appears to have been taken from a sixteenth-century print of King Darius by an unknown artist, published by Gerard de Jode which I couldn’t bring up. So, Jacob and his sons by Zurburan. These are all life size paintings and the story of their creation and the quotes from the Bible made it an interesting exhibit although my brother did not think it was particularly worthwhile saying he found the paintings ugly, something I don’t agree with. This is the main link to the exhibit on the Frick website with a number of other links off to the left if you want to explore this further. This is a review from the New Yorker. Prior to arriving at the Frick the exhibit traveled first to the Meadows Museum in Dallas. This is a video from that website. While I was there I was pleased to see that Vermeer’s Lady with Maid was back on view and I got a chance to revisit the Murillo self-portraits I wrote about last year. And now, the actual weekly Flickrs. I’m not thrilled with the weather today. It’s mild which is good but it’s also rainy which is bad. Normally I wouldn’t particularly care if it rains late in the day but I’m meeting my brother in the City for dinner tonight and I’m not looking forward to a soggy commute. It opens up the possibility of delays on the bus, especially going through the Lincoln tunnel. And as I plan on walking to the restaurant from the Port Authority, a distance of roughly 18 blocks it won’t be fun if it’s raining. But I’m looking forward to seeing my brother. Since I retired I’ve made it a point to try and have dinner with him every two months just to physically stay in touch although we email back and forth daily. Looking forward to discussing movies and books. I was back at the Metropolitan museum this week to see the just opened Asian exhibit, Diamond Mountains: Travel and Nostalgia in Korean Art. Korean art is much like Japanese and Chinese with scrolls and screens as well as wall art. It was a small exhibit, just one room, but had many beautiful things in it. Most of the items in the exhibit are from the National Museum of Korea and have never been exhibited in North America prior to this exhibit. The Diamond Mountains are in North Korea so there are no photographs as few outsiders visit them. The items range from the 18th Century to contemporary times. Here are some of things I though nice. Shin Jangsik - Raining on Manmulsang Rocks – This is one of the contemporary paintings which in its black and white acrylic sets a moody and eerie atmosphere. Unidentified Artist - Mount Geumgang – This is, I guess, something similar to the Venetian capriccio paintings in that the peaks don’t exist the way they’re depicted, moving vertically rather than horizontally. I like the orange sun way up on top on the left side of the mountain, the source for the flame like edges of the peaks. Jeong Seon - Manpok Valley, from the Album of Divine Paintings by Gyeomjae [Jeong Seon] and Hyeonjae [Sim Sajeong] (Gyeomhyeon sinpumcheop) – The four tiny travelers contrast the immensity of the mountain range. 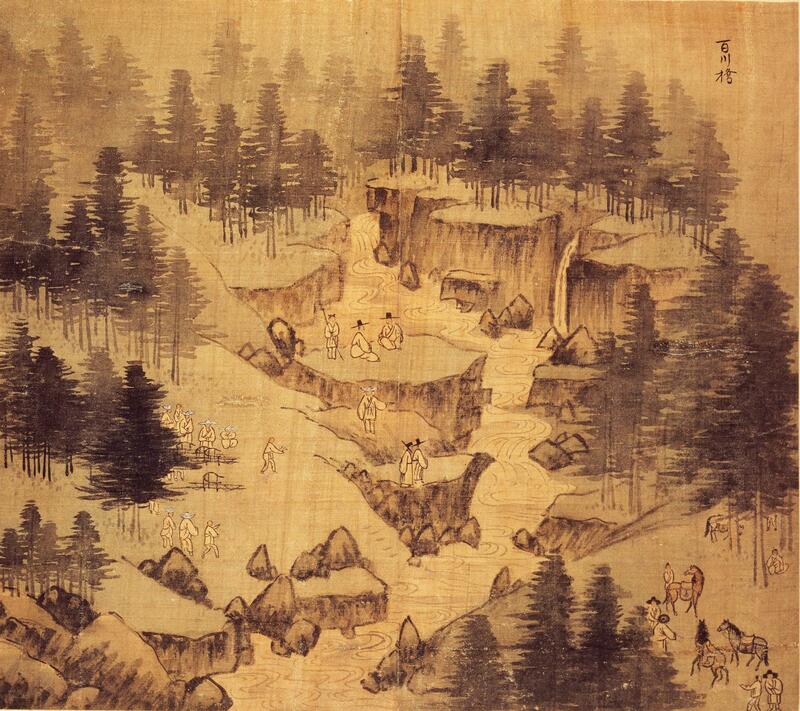 Sin Hakgwon - General View of Inner Geumgang – On this long scroll, moving from right to left, the artist takes you on a tour of the mountain range showing the grass covered hills along with streams and Buddhist temples. If we could read Chinese we would see that he names 46 different sites. Jeong Seon - Album of Mount Geumgang (Pungak-docheop) – When you click on the first link you go to the Met website and see one of six images from the album, General View of Inner Geumgang and when you click on the second link you see, Baekcheon Bridge. The actual bridge isn’t shown but you can see the travelers and the different modes of transportation, sedan chairs and horses. This is an overview of the exhibit from the Met website and the second link is to all the objects in it. This is a well-illustrated review from the NY Times. I’ve reported on my many visits to the Frick Museum and I thought you would enjoy this video about the museum’s history and collection. And now, let’s visit the Flickrs. One year ago vs today :0 i’m so glad i became a girl! The Nor’easter has come and gone and we were lucky in New York/New Jersey. I went out for my walk Friday morning and it was absolutely miserable, snowy rain, cold and very heavy winds which unfortunately continued into today. I can hear the wind howling now, but I’m very happy that we didn’t receive any accumulation of snow. I had my handyman tighten up the bolts that hold the awning on the side of my house so I no longer have to fear coming home and finding it in the middle of my driveway. The old saw says March comes in like a lion and I’m hoping to see the lamb soon but you can never count on anything when it comes to Mother Nature. I remember snow flurries in April around my birthday when I was a child. I visited the Met for the latest rotation in the drawing corridor, Selections from the Department of Drawings and Prints: Portraits and States. I wrote to my brother saying I thought this was a bit of a disappointment and he replied that he liked the Old Master drawings finding them impressive. I agree but my disappointment stems from the fact that half of the exhibition is contemporary and not really of interest to me. And while the drawings are beautiful none are of the more recognizable names, at least to me. That being said, here are some of the things on display. Bust-Length Portrait of an Ecclesiastic - Carletto Caliari – Caliari was the second born son of Paolo Veronese who worked as his father’s assistant. It’s a colorful chalk drawing of a middle-aged cleric. Saint Peter - Bernardo Strozzi – Black chalk depiction of a quizzical Saint Peter drawn in a naturalistic style, which was at the time a movement away from elegant Mannerism. Below is also a link to a Wikipedia discussion of Mannerism. Bust-Length Portrait of a Woman - Agostino Carracci – Another rebel against Mannerism – This is from the website description of the drawing. Agostino's depiction of a partially blind woman (her glazed right eye is unseeing), drawn from life, exemplifies the new naturalism that lay at the heart of the Carracci reform. The unknown sitter is both physically and psychologically present: even with her impaired vision she confronts the viewer with an unwavering gaze. Details such as her slender neck scarf, hoop earrings, and braided coif dressed with bows or flowers (adornments indicating that, unlike Annibale Carracci's portraits of blind subjects, this sitter is not impoverished) are confidently rendered. This powerful, exceptionally lifelike portrait is among Agostino's most important and accomplished red-chalk drawings. Head of a Bearded Man - Giovanni Serodine – An artist influenced by Caravaggio, this is apparently his only drawing, watercolor over black chalk. Head of a Bearded Man - Domenichino (Domenico Zampieri) – Possibly a study for a figure in one of his paintings although it can’t be connected directly to any of his known works. Black chalk drawing of a serious, respected individual. This is the overview page for the exhibit which also has a link to view all objects in the exhibit. While at the Met I visited a second exhibit, a small one in a single gallery on the mezzanine, Dangerous Beauty: Medusa in Classical Art. It consisted of mostly objects that depicted Medusa and other female half-human beings from Greek mythology. The Met didn’t post any images from the exhibit but I’ll link to a few of them. Limestone funerary stele (shaft) surmounted by two sphinxes – The Sphinx is another female hybrid, half woman, half lioness. The sphinx stele’s served as watch dogs to guard tombs against defilement. Head of Medusa Cameo, Italian 1880 – White onyx on a black background showing Medusa’s beauty framed by voluminous hair with writhing serpents. There were only two hanging items in the exhibit, an etching and a painting, both of which appealed to me. The Sin – Edvard Munch – This lithograph depicts a femme fatale with long flowing red locks, emerald-green eyes and a blank expression. Her hypnotic, alien stare is reminiscent of Medusa’s petrifying gaze. This is a link to the Met’s overview page for the exhibit. This is the Met’s press release. These exhibits are good examples of the wonders of the Met, little shows that can be put together from the permanent collection. Despite the size and scope of the physical museum there is so much of the permanent collection which isn’t on regular display. I was concerned about the dearth of available exhibits but it looks like there are a bunch in the offing which I’m looking forward to and will report on. We had our second encounter with a Nor’easter this week and while it wasn’t as benign as the previous one it certainly could have been worse. At least for me and the people from my community. There were wildly varying amounts of snow in New Jersey with some accumulations reaching two feet but we were lucky and only received about six inches. And the next day was milder and the snow started to melt. Today was a bit chilly as it was windy and felt colder than it should have. Daylight savings seems to have come very early this year and I hadn’t given any thought to it until today. Usually it pops up on my radar at least a few days before. Not looking forward to losing the hour of sleep as I plan to call friends at 10AM and I’ll have to get up very early to get in my usual Sunday morning routine. I was back at the Met again this week for the recently opened new Japanese rotation, The Poetry of Nature: Edo Paintings from the Fishbein-Bender Collection. I’ve been looking forward to this for a while, the Met generally rotates their Japanese collection twice a year so each iteration is up for some time. Since I’ve become attuned to Asian art I’ve enjoyed each version, albeit some more than others. This particular exhibit is wonderful as it plays into my likes with many scrolls, screens and wood block prints. Out of the more than 100 objects in the exhibit 40 come from the Fishbein-Bender collection and are gifts or promised gifts to the museum. Many have never been displayed in the western world. Longtime residents of New York and supporters of The Met, Estelle P. Bender and her late husband, T. Richard Fishbein, shared a love of art and travel, especially to Europe and Japan, since the time they met in the late 1970s. I expect the second rotation to appear in the summer. I’ll list some of the many things I liked. Be sure to read the descriptions on the website. Fudō Myōō Threatening a Novice - Tsukioka Yoshitoshi – I’ll start with my favorite form of Japanese art, the wood block print. This brilliant triple panel is a colorful depiction of a dream by the monk, Abbot Yūten. You can see the implicit violence as a statue of a deity comes to life and threatens the monk with his sword. Honoring the Three Gods of Poetry: Women Composing Poems - Chōbunsai Eishi – Another triptych wood block print, this is a busy illustration of women at work composing poems. The women are depicted in their beautifully decorated robes while we can see the landscape through the open windows at the back and also the artwork adorning the walls of the room behind. The Courtesan Hinazuru of the Chōjiya Brothel (Chōjiya Hinazuru), from the series Beauties of the Pleasure Quarters as Six Floral Immortals (Seirō bijin rokkasen) - Chōbunsai Eishi – Here’s a single panel by Eishi of one of the six courtesans, the courtesan, Hanaōgi, also appears in the exhibit. Courtesan Holding a Poetry Slip - Chōbunsai Eishi – Another of Eishi’s courtesans, this time depicted on a scroll. We see her red kimono decorated with cherry blossoms and spider webs while her outer robe seems about to drop off her shoulders. Puppies in the Snow - Nagasawa Rosetsu – These four sliding panels have been in previous exhibits and I linked to them a few years ago but its sparse playfulness appeals to me so I’m bringing it back for an encore. Crane and Pine Tree with Rising Sun - Suzuki Kiitsu – This remarkably beautiful hanging silk scroll vibrates with vivid colors, the bright red of the sun, the lush green of the tree and the black and white crane with the dab of red at its crown. Egrets and Crows - Shibata Zeshin – The whiteness of the egrets shown isn’t painted, the artist cut them out of the gold leaf paper. The whiteness of the two egrets offsets the blackness of the three flying crows. Red Shōki, the Demon Queller - Katsushika Hokusai – While there were none of his wood block prints in this exhibit we have this hanging silk scroll. It was painted towards the end of his long life, he was 87 and passed away at 88. Shōki appeared as an exorcist in a dream of a subsequent Chinese emperor and vowed to quell demons and banish disease. Hokusai used red pigment for the painting as folklore thought it warded off smallpox. Winter Scene with Ducks and Pine Trees - Matsumura Goshun – A snowscape depicting a brisk but not bitter cold day with ducks floating gently in a serene setting. Seiken-ji and Mount Fuji - Soga Shōhaku – This large hanging scroll is a panoramic view showing Mount Fuji looming over the landscape and the small village with the Seiken-ji temple. This is a link to the overview page of the exhibit. This is a link to the Met’s press release. This is a link to all the objects in the exhibit. Lots of beauty here to be appreciated. Look forward to the second rotation. I visited the Met a second time this week for another of their small exhibits consisting entirely of works from the permanent collection, American Painters in Italy: From Copley to Sargent. This was a wonderful compilation of drawings and watercolors with heavy emphasis on John Singer Sargent. As I’ve commented before, how amazing to be able to just pull all of this out of your attic for an exhibit. There wasn’t anything I didn’t like so I’ll just show some examples. Perseus - John Quincy Adams Ward – This pencil sketch is of Perseus holding the head of Medusa, a topic that I addressed in the Medusa post recently. Very spare and beautiful. Creation of Adam; Sleeping Adam, after Michaelangelo; Other Figures; Profile of Head of Man in Helmut - Thomas Sully – This is an ink drawing based on Michelangelo’s Adam. Very timely after the recent post on Michelangelo. Down below we’ll see Sargent’s recreation of Michelangelo. Torre dei Schiavi, The Roman Campagna (from Cropsey Album) - Jasper Francis Cropsey – Cropsey is one of the Hudson River painters and the notes on the website point out that the Roman Campagna was a favorite milieu for American painters and mentions several who also painted the ruins, one of whom is Sanford Robinson Gifford , another painter I’m fond of. His oil painting is the second link. This drawing is fairly tiny, roughly 4” x 6”. Castel San Elmo (from Cropsey Album) - Attributed to Jasper Francis Cropsey – It’s authenticity as a genuine Cropsey may be in doubt but regardless it’s a wonderful depiction of a 14th Century Neapolitan Castle. 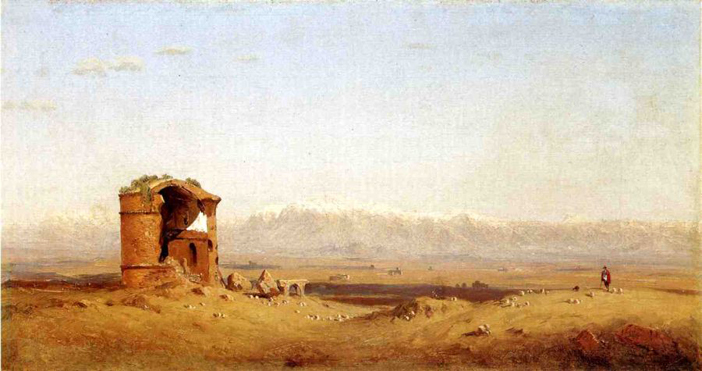 Girgenti (The Temple of Juno Lacinia at Agrigentum) - William Stanley Haseltine – More ancient ruins here, a splendid pencil and watercolor depiction of the Temple. It’s hard to conjure how men were able to build these giant monuments without the aid of modern day devices. The number of men it took must have been phenomenal. Interior of Church, Sienna - Julian Clarence Levi – Levi was an architect and this pencil and watercolor painting was created with an architect’s eye. Note in Pink and Brown - James McNeill Whistler – Whistler is someone else I’ve always enjoyed, both his paintings and etchings of which there are many. I’ve been lucky to see a number of exhibits of both. The website says this is one of a hundred pastels he created in Venice and based on that I’m surprised I haven’t seen more of them over the years. Night - John Singer Sargent – Sargent was born in Italy and spent his childhood there. He especially admired Michelangelo and was only 14 years old when he drew this recreation of Michelangelo’s sculpture. You can see that in the second link. The Marriage at Cana (from scrapbook) - John Singer Sargent – He created this pencil and watercolor drawing just a few years after Night. This is a recreation of a work by Tintoretto, who along with Titian was someone else Sargent admired. You can see the original at the second link. There are 12 paintings in the exhibit by Sargent and I thought the four below were a nice representation of his vibrant watercolors. In several it’s commented that he painted them as if from a gondola looking up. This is the overview of the exhibit. A good week all around for viewing art. Now let’s view this week’s Flickrs. Book Cover - Paul to Paula – Having come across this the other day I see the link has now been disabled. But apparently the book is legit, see second link. And the third link is the author's Facebook page. This is an early Flickr as in a little while I will head down to the Jersey shore to spend some time with friends. We had our third Nor’easter this week but like the first it didn’t bring any accumulation of snow. While we’re now just a few days away from Spring on the calendar the weather forecasters are saying that the cold weather will linger for a while. It was a pretty chilly week here, again due to the wind which has been higher than usual. I’m just hoping we see no more snow. I visited Swann’s Auction House for the first time this week. Swann’s isn’t on a par with Christie’s and Sotheby’s but they’re still a player in the New York auction market. It was their prints and drawings auction and the room was filled with many beautiful things, literally hundreds. But I don’t like their viewing system, all of the art is tagged with a number without any identification so you have to carry the catalogue with you while you view. Being an enormous collection the catalogue was very heavy and the art isn’t exactly in numerical order which made for awkward cross referencing. I was particularly interested in seeing two Edward Hoppers I noticed on the website and on my initial pass through I didn’t find them. This was annoying but then I noticed they were set up in a separate display case at the front. This is a link to all the items in the auction. There are three pages from the catalog, well over 400 items. Click on the individual images to enlarge. These were the only Hopper items in the auction but for most of the other artists there were multiple pieces and I’ll just provide a random sampling. EDWARD HOPPER - House by a River. Six American Etchings, Series I. – One is by Hopper and at the same link you can click on images of the other five. JEAN-FRANÇOIS MILLET - Les Glaneuses. – Millet was a French 19th Century painter of peasants. This is a drawing of arguably his most famous painting which translates from the French as The Gleaners. The second link is for the oil painting. JAMES A. M. WHISTLER - Quiet Canal. – An etching from his second set of Venice drawings. JAMES A. M. WHISTLER - Fumette. - Fumette, or 'Racy' as her nickname translates, was also known as 'La Tigresse' because of her hot temper. Her real name was Héliose; she was a milliner from the Latin Quarter of Paris and one of Whistler's models and mistresses during the late 1850s. ÉDOUARD MANET - Le Chat et les Fleurs. – Not many of Manet’s drawings survived. This is from a long essay about the artist, his life and work. “Alongside painting Manet enjoyed drawing and print making. Although not many of his drawings still exist, those that do are certainly impressive. Again, he worked from reality and like in his paintings, the lines in his drawings are firm and strong. Manet was partly responsible for the revival of print making. Many of his prints were copies of his paintings and Manet believed in 'pure' etchings. Manet's goal was to produce paintings that accurately reveal to the viewer his reality.” The second link goes to the website. CLAUDE MONET - Maison au toit de chaume, Gainneville. – 17 year old Monet showing his precocity in this simple drawing of a thatched farmhouse. ANDERS ZORN - The New Maid. – Zorn was a Swedish artist of the 19th/20th Century. Some time ago I saw an large exhibit of his work at the National Academy of Design which showed that he was brilliant in whatever medium he was working in. THOMAS MORAN - Morning on the St. Johns, Florida. - Moran was a Hudson River painter known for his large landscapes but he also created these beautiful engravings. This particular one also hangs in the National Gallery of Art. MARTIN LEWIS - New York Nocturne. – Lewis is someone I discovered at the auctions and he quickly became a favorite. Not surprising as he more or less taught Hopper the basics of etching. I could keep going but I’ll end here as I think it’s a good sampling of what I saw. Go to the full list to see the rest of the selection which is equally good.